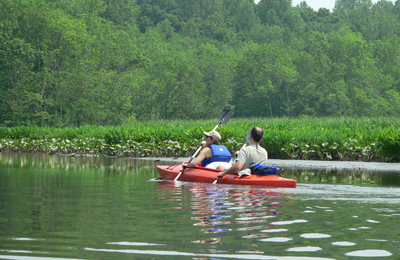 The Eastern Shore – that piece of land on the east side the Chesapeake Bay has scores of paddle trails for canoes and kayaks. With thousands of miles of shoreline lacing in and out of three states and with thirteen counties, there are a few trails that are worth traveling miles to see and experience. Every avid outdoors-person should add the Eastern Shore to his or her bucket list. The water trails are abundant and diverse with killer scenery. Most of the trails are in or near low populated areas with small, historic towns. This lends itself to cycling, hiking and enjoying the culture of small town America. As an avid paddler and a resident of Maryland’s Eastern Shore, I’ve listed my top ten water trail recommendations for the Eastern Shore. These are all trails I have paddled and loved. There are many wonderful trails I’ve not mentioned, but these – at least for me – stand above the rest. All the launch sites and locations are identified in a custom Google map I created for this post. 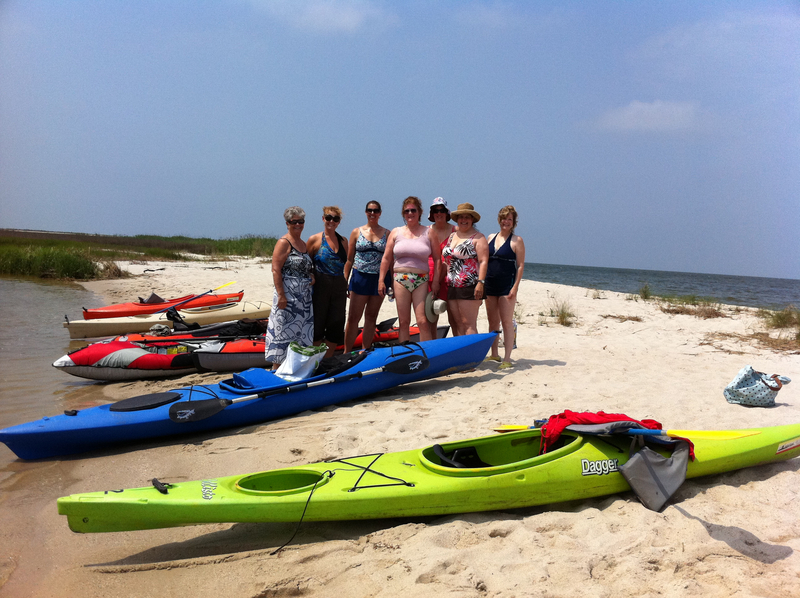 We love kayaking and have been checking out trails here on the “the Shore” for the last twenty years. Normally, though I don’t review the trails from a kayak on dry land as shown in the picture below. Hee hee hee. UPPER CHOPTANK – Part of the John Smith Chesapeake National Historic Trail, the Upper Choptank and Tuckahoe Rivers encompass 80 miles and are set in pristine wilderness, not harshly affected by development. The Choptank River, the longest river in Maryland, and the Tuckahoe were likely part of the Underground Railroad system that allowed African-American slaves to escape to freedom. The landscape has changed little in the last 150 years. Launch in Denton at the Joppa Steamboat Wharf which replicates an 1883 terminal building with passenger waiting room and agent’s office. Trail meanders through towns, forest, marshes and historic areas. Marshyhope Creek is an ecological greenway that extends from just above Federalsburg down through Dorchester County ending at the Nanticoke River. Launch at the Federalsburg American Legion public boat ramp. Then head down the creek toward Dorchester. The landscape includes wooded banks, wetlands and wildlife habitats. If you head upriver (towards Denton), the creek enters a forest and is magnificently shaded. This part of the creek can have obstructions but it’s worth a paddle. Travel Hag Lisa Ludwig paddling the Transquaking Loop. Blackwater Wildlife Refuge is a region unlike any other in Delmarva. The vast marshlands, tidal pools, pine forests, big sky and amazing light makes Blackwater a destination for artists, painters, photographers and outdoor enthusiasts. It was originally created as a haven for migratory birds along the Atlantic Flyway. Today this region supports over 35% of all wintering waterfowl that use the Atlantic Flyway. Estimations are that over 25,000 geese, 15,000 ducks and 5000 snow geese winter in Blackwater. There are two scenic rivers that provide amazing paddle experiences and I’ve identified three separate trails in this Blackwater region on the Google Map of Top Ten Eastern Shore Paddle Trails. #8A – The Upper Transquaking River runs straight up the middle of Dorchester County mostly through the farms and wetlands of the part of Dorchester that natives refer to as “Down Below.” This trail starts near the headwaters of the river on Drawbridge Road (public launch), and is an easy paddle, leisurely and enjoyable – perfect for the beginner as well as the expert. The trail is sheltered and passes by wooded banks, open wetlands and farm area, and is incredibly quiet. It ends at Decoursey Bridge where disembarking is possible next to the bridge. This is also a very haunted bridge. So if you’re into ghost stories, imagine Big Lizz coming out of the swamp at Decoursey Bridge (with her severed head in hand – eyes glowing red). See her calling you into the swamp, leading you to her master’s long lost fortune. #8B The Transquaking River Loop covers the lower part of the Transquaking River before it empties into Fishing Bay. This landscape (pictured above) is mostly marsh with lush grasses and the occasional dead tree where bald eagles and osprey love to perch and nest. There are some wooded river banks as well. This is a great trail for seeing wildlife such as otter, eagles, and herons. The wind can be a factor because of the open marsh. There is almost no development around this trail. 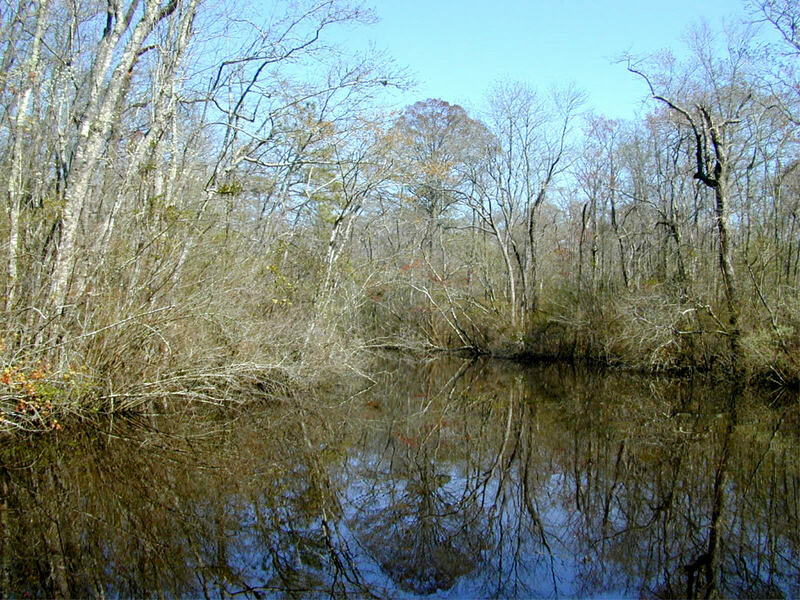 #8C The Blackwater River runs through the wildlife refuge and across vast open space. The scenery is stunning, and it’s not uncommon to see a bald eagle or two. The light is spectacular on a clear day. Launch from Shorter’s Wharf and paddle WNW to find the Blackwater basin, or head the other way and take in the wildlife. Blackwater Wildlife Refuge downloadable brochure. Tilghman Island in Talbot County is flanked by the Choptank River and the Chesapeake Bay. Ten different water trails are identified on the island. 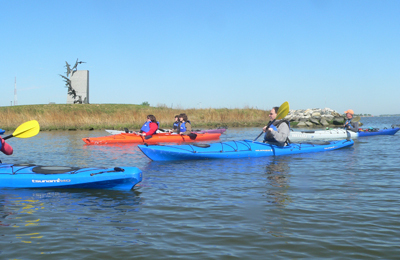 They feature beginner, intermediate and expert trails that cover placid coves, tidal marshes, harbors, and the wide waters of the Chesapeake Bay that run between Tilghman and Poplar Islands. Talbot County Tourism provides a free downloadable Tilghman Island Water Trail Guide that shows these ten trails as well as launch sites and landmarks. 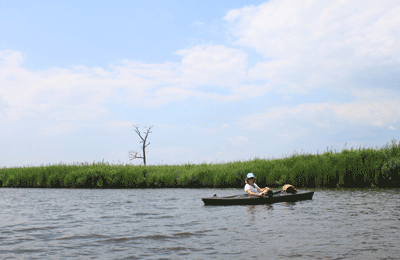 Tilghman Island could be a favorite destination for kayakers anywhere. There’s enough paddling there to fill up a week. The Blackwalnut Trail – This easy trail starts in a sheltered cove and follows the soft shoreline of the Blackwalnut NRMA then wraps around the rest of the cove. Public launch is indicated on the trail map and on my Top Ten Kayak Trails Google Map. The Knapp’s Narrows Trail – This would be my second choice on Tilghman because it reveals the culture of the island. Launch at the public launch at Dogwood Harbor, then follow the trail along the shoreline and through Knapp’s Narrows under the busiest drawbridge in the USA. (In 2011 it opened 10,800 times.) This area shows a working waterfront with workboats, a seafood processing operation, a hospitality icon – Harrison’s Chesapeake House been accommodating tourists – especially hunters and fisherman for over 100 years. Captain Wade Murphy keeps his famous Skipjack, the Rebecca T. Ruark at Dogwood Harbor. This trail lets the paddler peek into the culture of the Island people. After paddling through the Narrows, follow the trail up into Back Creek through wetlands and tidal marsh. This trail runs from the headwaters of the Nanticoke to Seaford, DE. The Nanticoke is Delaware’s largest watershed and only half of the river is in Delaware. The Nanticoke is listed on the Nationwide Rivers Inventory under the classification of Wild and Scenic River Systems. This is because of the Nanticoke’s undeveloped nature. It has extensive unbroken forests lining the river, and the highest concentration of bald eagles in the northeastern United States. The upper portion of the river is unspoiled and has changed little since the indigenous American people lived here on its banks. Launch at public ramp in Seaford noted on my Top Ten Kayak Trails Google map. This trail starts in the Pocomoke River at the public launch at Winter Quarter Landing. – See this identified on the Top Ten Kayak Trails Google Map. A short ways up the Pocomoke is the entrance to Dividing Creek, so named because it divides Somerset and Worcester counties. This is a water trail through a cypress swamp. The bald cypresses and other hardwood create a thick forest that is so shaded in the summer that the water looks black. The natural setting alone is worth the paddle up this beautiful waterway. Because of the thick forest barrier, this is a great paddle during the heat of the summer and in the winter months as well. A little known but wonderful trail that runs from Mardela Springs near Salisbury to the Nanticoke River across from the town of Vienna. Barren Creek snakes past forest, farms, homes, barns and thick forests. Much of the middle of the trail is total shade with leisurely paddling and soft currents. The creek eventually finds its end at a salt marsh and the Nanticoke River just across from Vienna. What’s so amazing about this trail? The seclusion and the diversity in landscape. It starts in a town park, then moves into an agricultural area, then into a forest and finally ends in a salt marsh with wide open skies and incredible light and wildlife. The paddler can hear the rustle of the marsh grass above her head as the wind passes through. 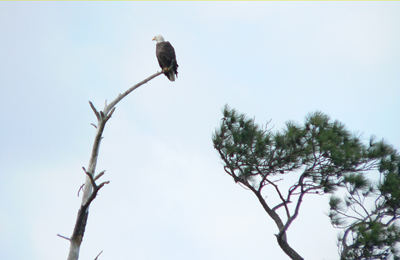 Bald eagles are abundant here and you’re almost sure to see one or two. Also turtles, foxes, racoons, otter, and a plethora of winged things… particularly (my favorite marsh bird) the red-winged blackbird. 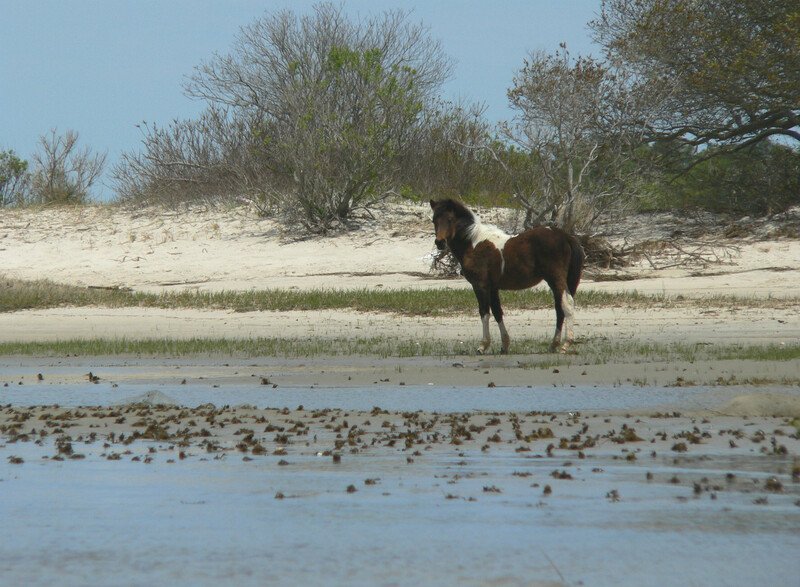 Who hasn’t heard about the wild ponies on Assateague Island? They are the descendants of the colonial settlers and still run wild along the uninhabited barrier island running along the Atlantic coast. Just across a small channel from Assateague Island in Virginia is Chincoteague Island, recognized as America’s best beach town by AOL Travel in 2010 and #3 Best Beach Town by Travel and Leisure Magazine in 2012. Chincoteague is friendly to paddlers and is the best place to launch from. I suggest Snug Harbor Marina ($5 launch fee) as a good launch site placing you in the Assateague Channel. Head toward the light house and find the narrow trail the meanders right up it. The light house has been signaling to mariners since 1867 and at the time of this writing it is being renovated. You can’t disembark here, but the close up views of the lighthouse are worth paddling up the trail. Head back up the channel, past Snug Harbor and eventually you’ll find a sandy beach on Assateague Island. Visitors are allowed to disembark here and walk the beach, have a picnic, watch the ponies and observe the abundant waterfowl. Past the beach is Toms Cove where the paddler has the benefit of paddling calm, sheltered waters while still being able to hear the sound of the Atlantic ocean waves breaking just over the dunes. Janes Island State Park has over 30 miles of marked water trails weaving in an out of the salt marsh that surrounds a series of small islands. Maps are available at the camp store or online. 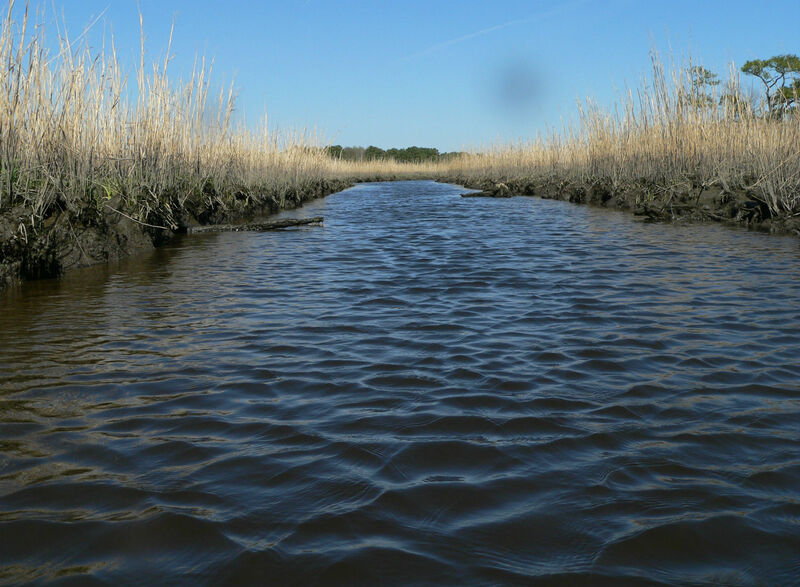 The pristine beauty of the marsh set against a border of pine forest and the Tangier Sound offers some of the most stunning beauty in Maryland’s waterways. Paddle out 1.25 miles to a 7 mile long sandy beach accessible only by canoe or kayak where beachcombers are known to find sea glass, shells and Indian arrowheads. Insect repellant is necessary. There is no fee to launch your own kayak at the State Park dock as long as you use the kayak launch and not the boat ramp. Extra benefit – sunsets over the Tangier Sound are some of the most dramatic in the entire Chesapeake region. 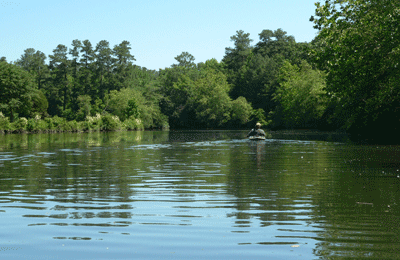 The Pocomoke River in Worcester County is Maryland’s deepest river for its width. Named for the Algonquin word meaning “black water” the river is dark – in some places, coffee colored due to the tannic acid leaking into it from the cypress trees common to the Pocomoke Forest. Launch at the Pocomoke River Canoe Company ($10 launch fee) in Snow Hill. The guides there are competent, friendly and enthusiastic about the Pocomoke River. It’s a 5 mile paddle each way. The water trail between Porters Crossing and Snow Hill runs through a densely forested cypress swamp. The forest canopy provides cool shade in the summer. The river is narrow and the water is still. 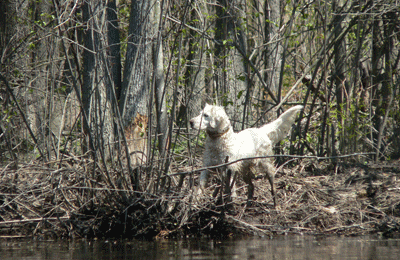 Wildlife is abundant in the summer especially if you paddle quietly and peer into the forest. There is life all around but not sound from the human inhabited world. This trail is secluded. Cypress knees push up through the water and on the banks, and it’s not uncommon to see otter or turtle swimming near your kayak. When the water is still and there’s enough light coming through the trees, an optical illusion is sometimes created with the reflections of the trees in the water’s surface. It becomes impossible to see where the waterline separates reflection from the actual trees. This can be a little startling at first especially if you look at the water and it appears that you’re looking “down” into a forest beneath you. So that would be my Top 10 – or Top 15 if count the Blackwater region as three and Tilghman Island as two. But there are scores of water trails on the Eastern Shore. From Cecil County at the headwaters of the Bay to Sussex and Worcester on the Atlantic Ocean all the way down to North Hampton in Virginia. But these are my favorites. Be sure to check out my custom Google map showing the locations and boat launches for the Top Ten Kayak Trails I mention in this post. And let us know what your favorite trails are in the comment section below. My wife and I have hauled our kayaks from Vermont to Maryland many times. We are always looking for new places. We enjoyed one paddle from Furnace Town to the river. You probably know the one. We were going to try Dividing Creek, but rained out. Now in our mid seventies planning another trip. Dividing Creek will probably be the first. Another should be from Mardela Springs. We paddled upstream and fished before, but assumed downstream would be all wide open grass, but your description make it sound much more interesting than that. Plus the tidal current would help with the longer paddle, IF we time it right. HI Carolyn. All of the trails mentioned in this post are flatwater trails – not whitewater or heavy current that runs into white water. Most beginners can handle them and I’m confident that if you and your husband are relatively fit, you’ll be able to handle these trails. Some are easier than others, but depending on weather, wind and the tides the swiftness of current can vary. That being noted, before you buy any kayak, you should rent the model you plan on buying – or a near model. It would silly not to. Also consult and outfitter. They are a wealth of information. Good luck and I hope you’ll let us know if you get one. Hi, Mindie. We’ve been talking to the folks at Annapolis Kayak in Eastport, and we are going to get an Ocean Kayak Malibu 2XL – in the works to buy it on Fathers’ Day weekend. 🙂 Can’t wait to get out and start paddling without being limited to a rental place! Congrats, Carolyn. Send us a pic of you two kayaking after the purchase next weekend. We’d love to see what you got. As a new kayaker…I am leery of tides. How important is it to check the tide tables on these trails? I would like to add Trap Pond to anyone’s list. Go in the middle of the week and get the “island campsite” so you can pitch your tent and put in your kayak from the same place! It’s a creepy kinda cool paddle down the creek. Yeah we heard banjos. Thanks for your posting….I will pass it on to the Wilmington Trail Club. Ruthie, I’ve heard Trap Pond is a great paddle. I’ll have to try it as I’m not too far from there. I’m not sure about camping on the island, but you’re right. Being able to launch from your campsite is so cool. thanks for stopping by this blog. Only one from Virginia, and all the rest from Maryland? How is this a *DelMarVa* list? What about the Winery Kayak trail in Virginia? The Onancock Creek Trail? No need to be critical, Lladan. I’ve paddled on about 40 trails across Delmarva including the Onancock Creek Trail, which was lovely. However, I don’t write these posts to be equitable to certain states, I write them because people trust my recommendations. And in my opinion, these are my top ten. There are 3 Counties in Delaware and 2 counties in Virginia on Delmarva… there are 9 in Maryland. Also, I included the Nanticoke Trail in Sussex County DE. thanks for reading the post and taking the time to comment. 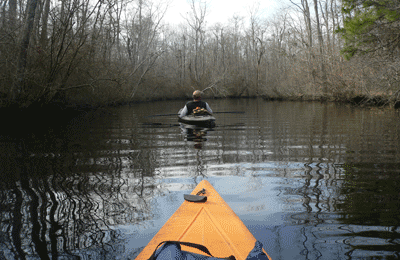 Thanks, Mindie, for spreading the good paddling word about the Pocomoke River. 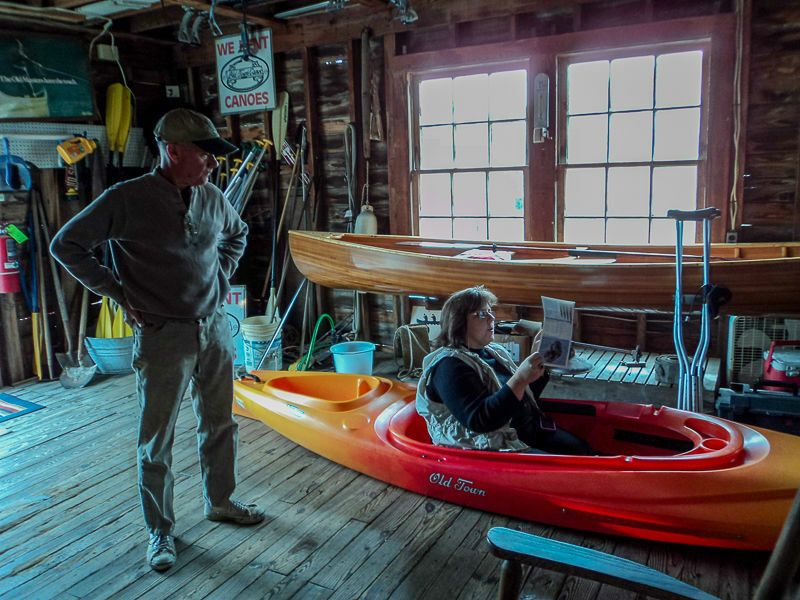 Everyone should know that there are portage services for private boats as well as canoe and kayak rentals and outfitting services at the Pocomoke River Canoe Company. Paddleboards are very popular on the Pocomoke, and offer a special vista of the Eastern Shore’s most beautiful river. I’ll do almost anything to get folks on my river, because they’re guaranteed a very special day. You are very welcome, Ron. Any time we get a chance to highlight the great services you guys offer there at the Pocomoke River Canoe Company, we’re all about it. Plus … you’re the star of the post. hahahaha. Someday I will paddleboard. Must lose 50 lbs first. I’m afraid I’ll sink. Thanks Mindie! I’m going to print this out and put it on my “to-do” list! let us know if you find yourself paddling down any of the these trails, patty. Would love to hear what you thought.